Happy Saturday! I hope the weekend is treating you well so far. 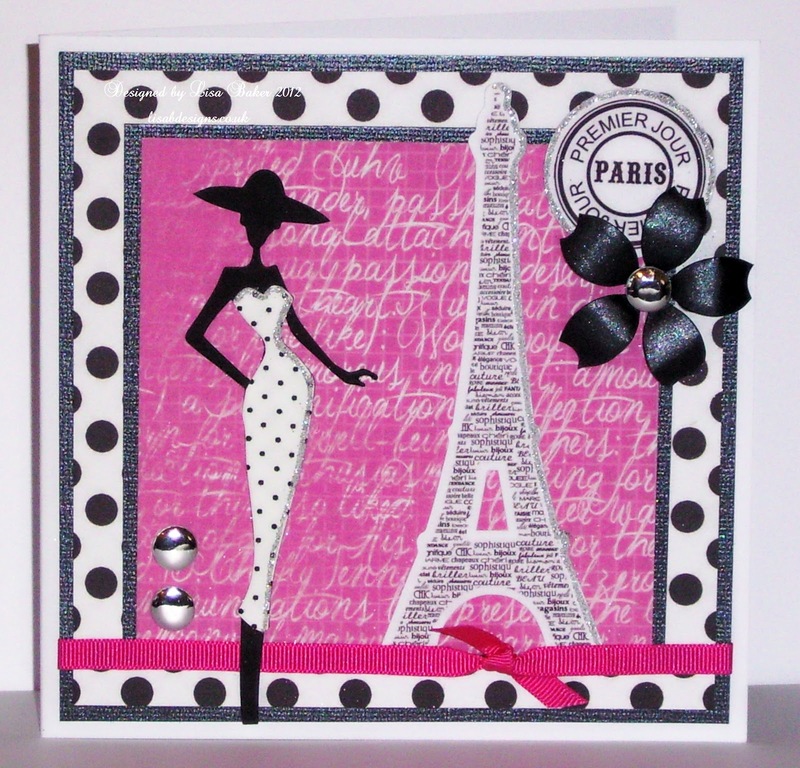 Lisa is demonstrating for J & C Creations in Exeter this weekend & I am busy, busy, but I want to take a few minutes to show you a few of the cards Lisa made with the Tres Chic collection & the Lovely Ladies die cut silhouettes. 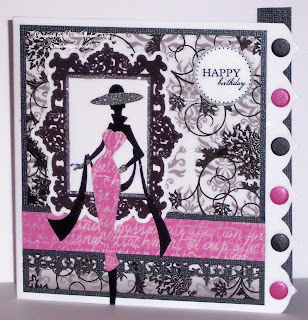 Could you find a better collection of patterned papers to use with these silhouettes?? 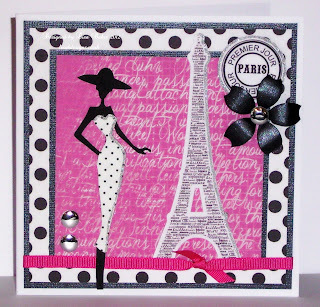 Very cleverly, Lisa has used some of the papers to dress the silhouettes. 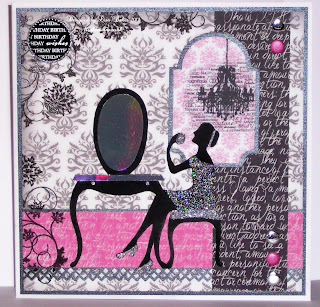 The dressing table silhouette comes with a piece of diecut silver card for the mirror. 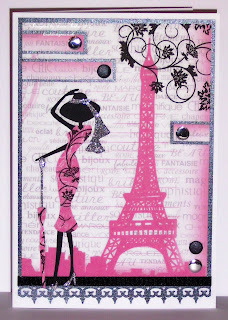 Adding card candi & glitter makes these cards blingtastic! If you like what you see, the 25% off promotions on both the silhouettes & the CWC collections continues on the website. Now I really must go. I hope to be back tomorrow, so until then, take care. Ah yes, those 'difficult' cards that we all have to make from time to time. Actually, I'm sure many of us enjoy making them, but I do struggle a little. 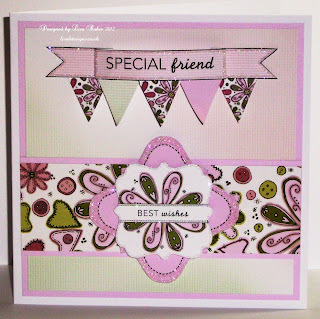 So, when I saw the Peas in a Pod elements of the CWC Sweet Pea collection, (which, like the rest of the CWC collections has 25 % off at the moment), I thought I would abandon the ribbons & flowers for little while & keep everything very simple. 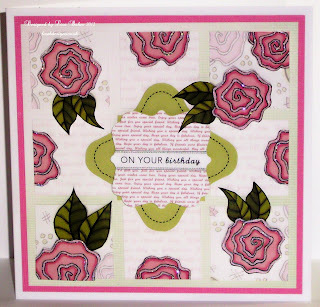 Chevron patterns are very popular in paper crafting at the moment & this one is very nice. The colours are blue, brown & green. I dry embossed a piece of kraft card & cut the end to match the paper. The script on this patterned paper is about flowers, but you'd have to look at it very closely to read what it says. I blended some Antique Linen & Tea Dye distress inks over the tag, to distinguish it from the background. 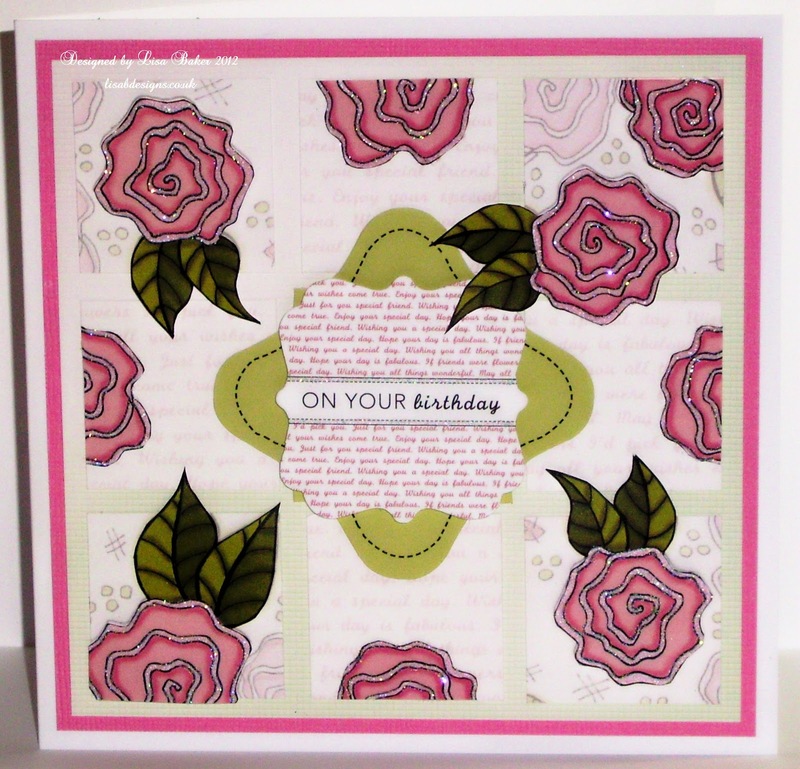 For this card I used the 8x8 embossed patterned card & combined it with Kanban stamp sets. The ticket strips took just minutes; repeat stamp the ticket with black ink on the kraft card & cut out. Thanks for visiting the blog today. Until next time, take care. Good morning. Lisa sent me photographs of the cards she made using the Craftwork Cards Sweet Meadow, so I thought I'd carry on from yesterday. I like the glitter on these cards. We use it in class sometimes & it's very effective. I don't use glitter all that much on my projects, but this is a good one. Note to self: buy some at the next class. This is one of the patterned papers from the collection & Lisa has cut the flowers from another sheet to add dimension. I love these big flowers & what a great idea to add the piece cut from the banner to the opposite side. The card blanks are 8x8, so that gives you an idea as to how big these flowers are. A very effective way of using the bunting. 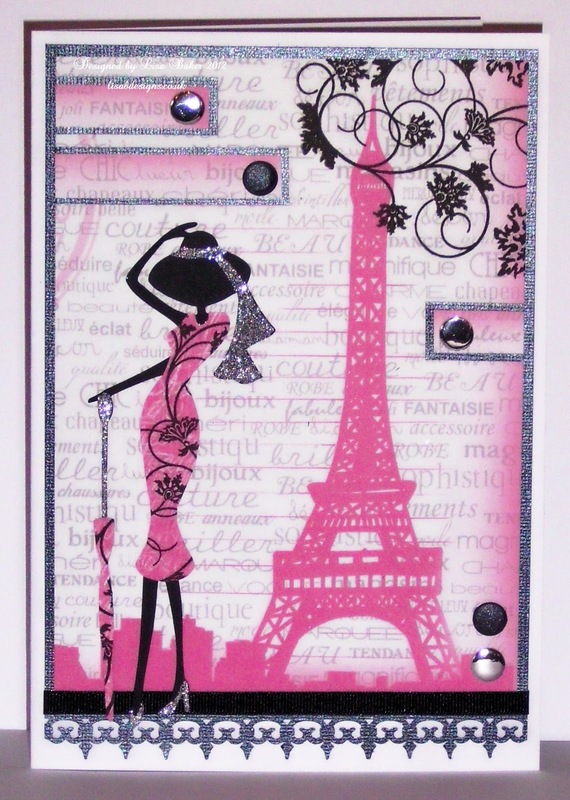 It's great that they're diecuts, no need for measuring & cutting out - two things I'm not very good at. 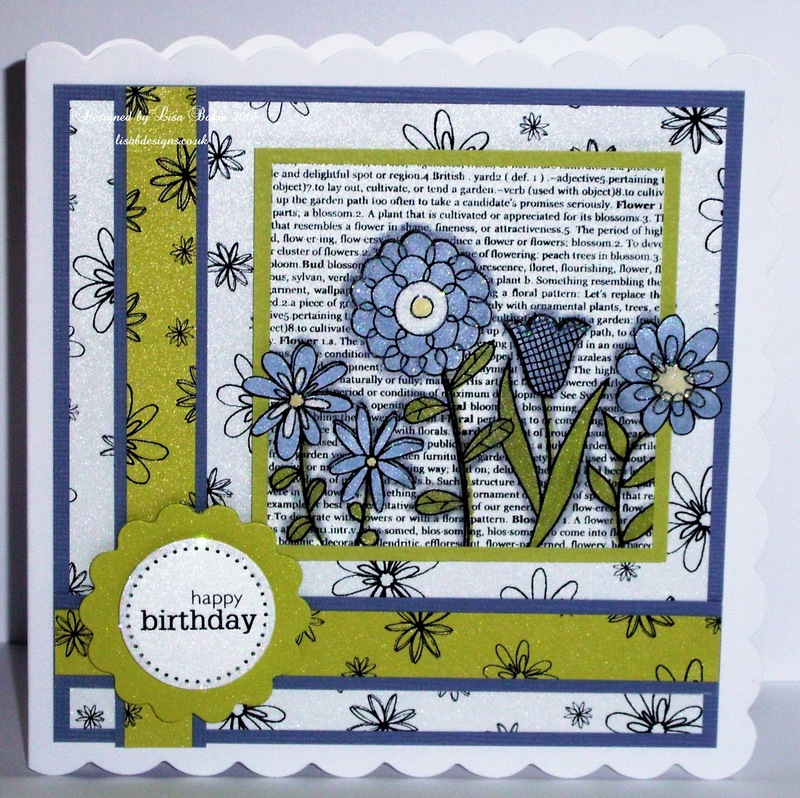 Clicking on the links will take you to each of the Sweet Meadow items & to see all the Craftwork Cards collections click HERE & remember, there's 25% off, so it's a good time to grab a bargain, or three. Lisa is travelling to Exeter, where she will be demonstrating at the craft show for the next few days, which means that any orders placed in the next few days won't be processed until she returns on September 30. If you're attending the craft show, stop by & say hello, she would love to see you. Thanks for visiting the blog today. Stay out of the rain & keep crafting. Good afternoon blog visitors, hope you're managing to stay dry. This is a pictue heavy post, so I shall try to keep the words to a minimum. 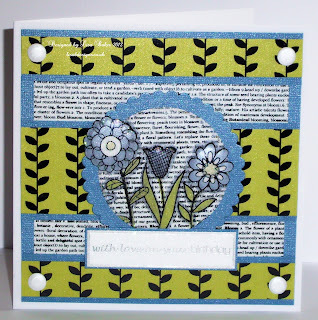 I had a little time last night to play with Craftwork Cards Sweet Meadow collection. 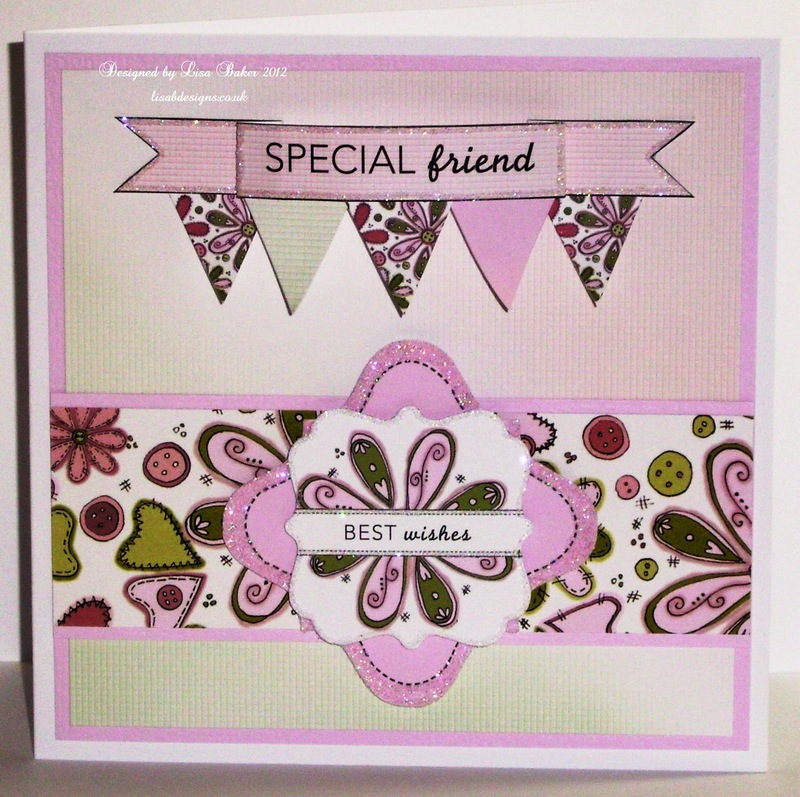 It's a very pretty set of patterned, plain & embossed papers & diecuts - banners, bunting, tags & messages. 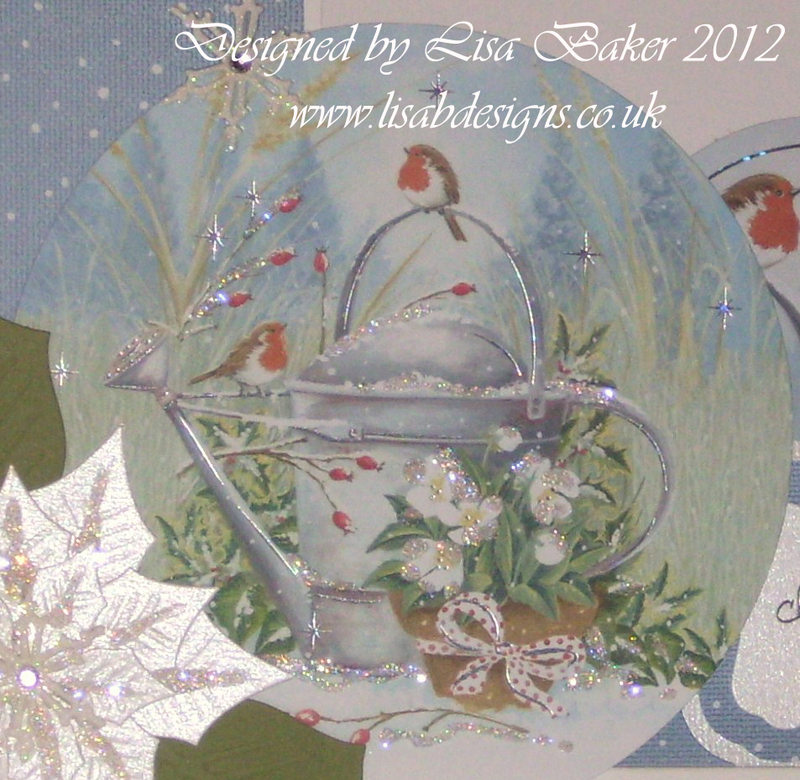 As with the other Craftwork Cards collections on the website there is 25% off at the moment. I started with a little box, made with two sheets of the patterned papers. 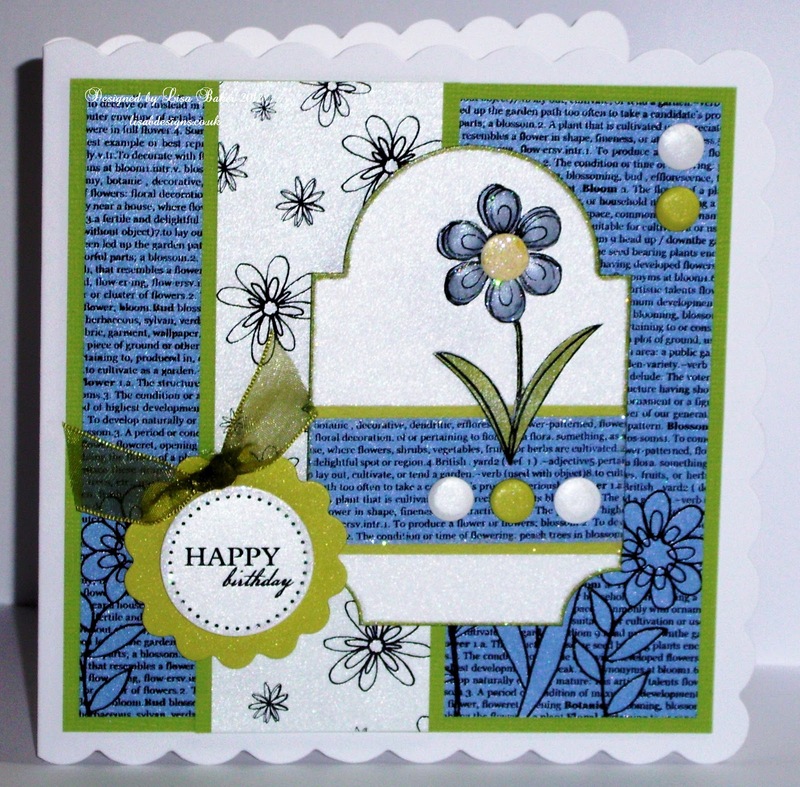 I fussy cut some flowers, cut strips to go around the box lid from other bits, added the diecut message & some Card Candi. Next, I made a tag, using a piece of Core'dinations card as the base. I wanted a smaller tag for the message, but didn't have a plain one, so I used one of the patterned tags as a template, drew around it & cut it out. A little bit of doodling gave it some dimension. I borrowed Lisa's idea of turning the Card Candi upside down & adding gems to the centres. My final project was a little tag book, made from scoring & folding a piece of Core'dinations card. I kept everything very simple & used a lot of offcuts as decoration. 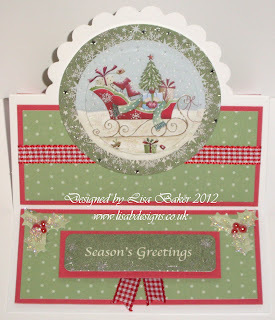 More fussy cutting. These are the embossed flowers & they are a lovely, pale, pale pink. The baker's twine that I used on the tags & on the cover of the tag book can be found here. That's it, thanks for looking. I hope these projects have given you some inspiration & I have a lot of elements left, so I'm sure I shall return to Sweet Meadow in the coming weeks. Until next time, take care. Good morning, I hope everyone had a nice weekend, despite the horrible weather. Sorry there was no post yesterday. Lisa was recovering from her 10 mile, moonlit walk, for the Heart of Kent Hospice & I had - and still have - a migraine headache. I don't get them often, thank goodness, but when I do, it's not good. Anyway, on to more important matters. 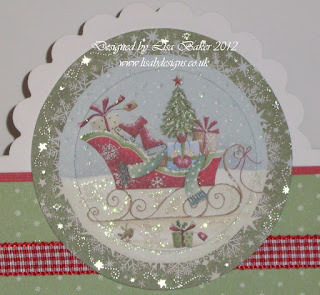 For the next few weeks on the blog, I'm going to be mostly concentrating on collections from Craftwork Cards. 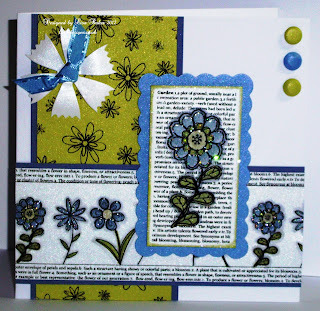 Obviously, I've been aware of Craftwork Cards for a long time, but haven't used any of the products, other than the Card Candi from time to time & of course, the card blanks, which are excellent quality. 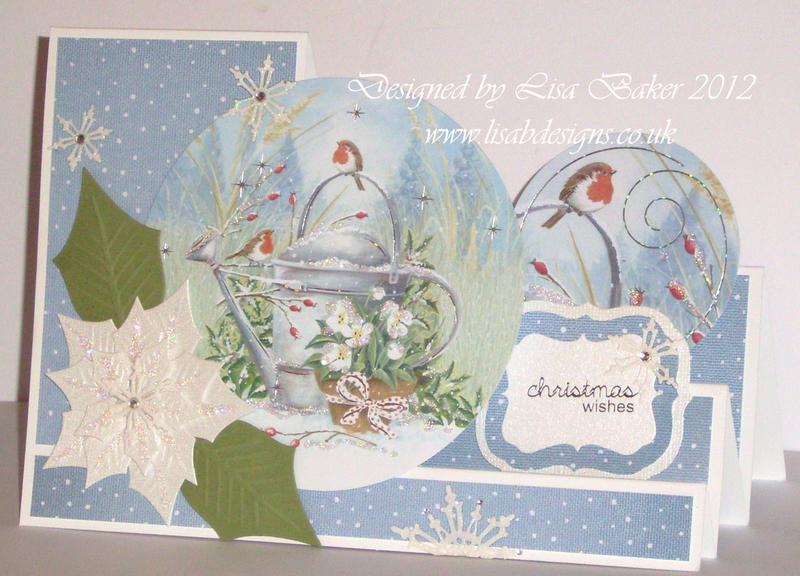 Lisa has given me a selection of products to play with & photos of her sample cards & my plan is to showcase the two in the coming weeks. 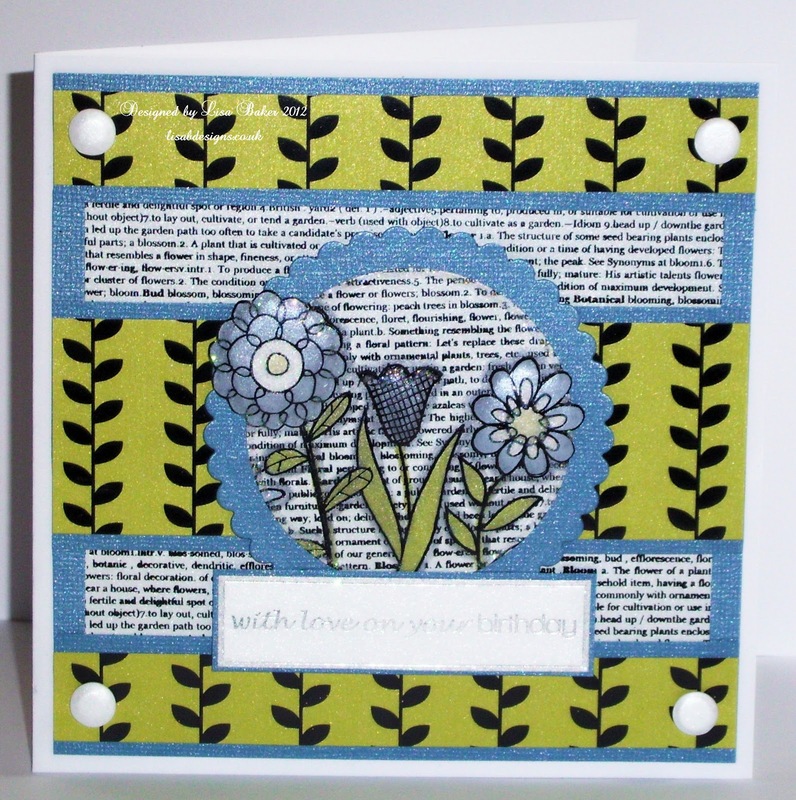 And the good news for you, lovely readers, is that there is 25% off EVERYTHING in the Craftwork Cards collections on the Lisa B Designs website. I'm starting us off with the Botanical collection. There are five elements in three colour ways in this collection & as the name suggests, it has a floral theme. 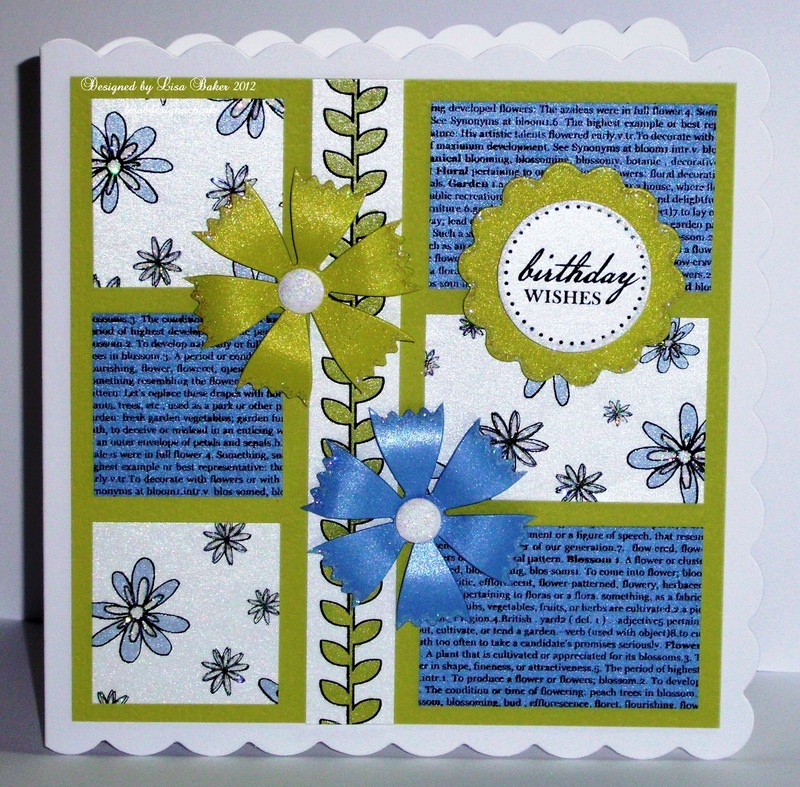 The three colours are : Caribbean sky, lime & white, Lisa has kept to those colours for all her cards & they go very well together. There are two sets of diecut scallops in the collection - circles & squares. 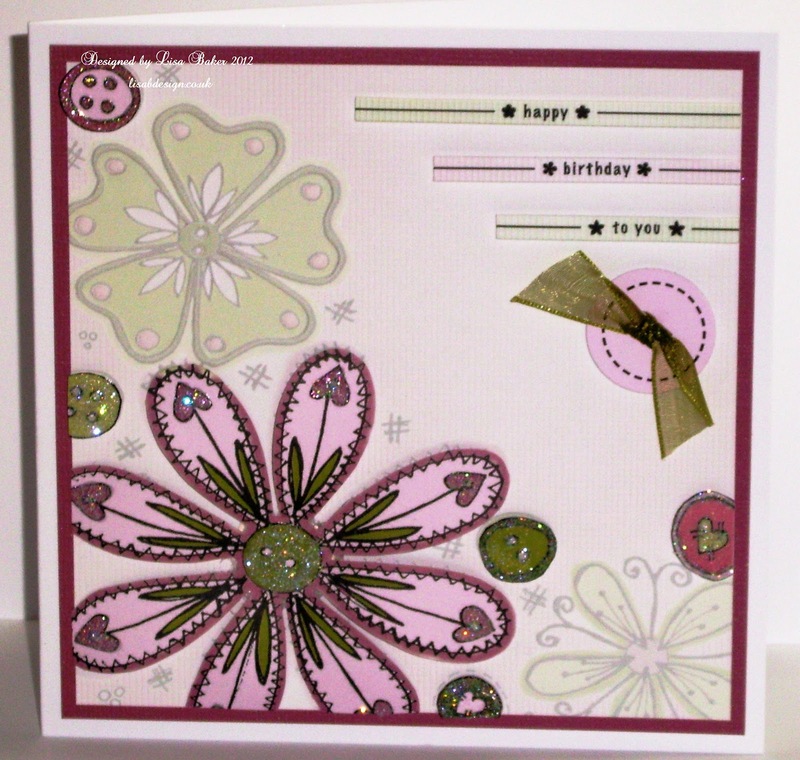 Lisa has cut into the circle scallops & added Card Candi to the centres to make flowers. The scallops are also a perfect fit for the Craftwork Cards diecut messages. Don't think you are limited to just these colours. 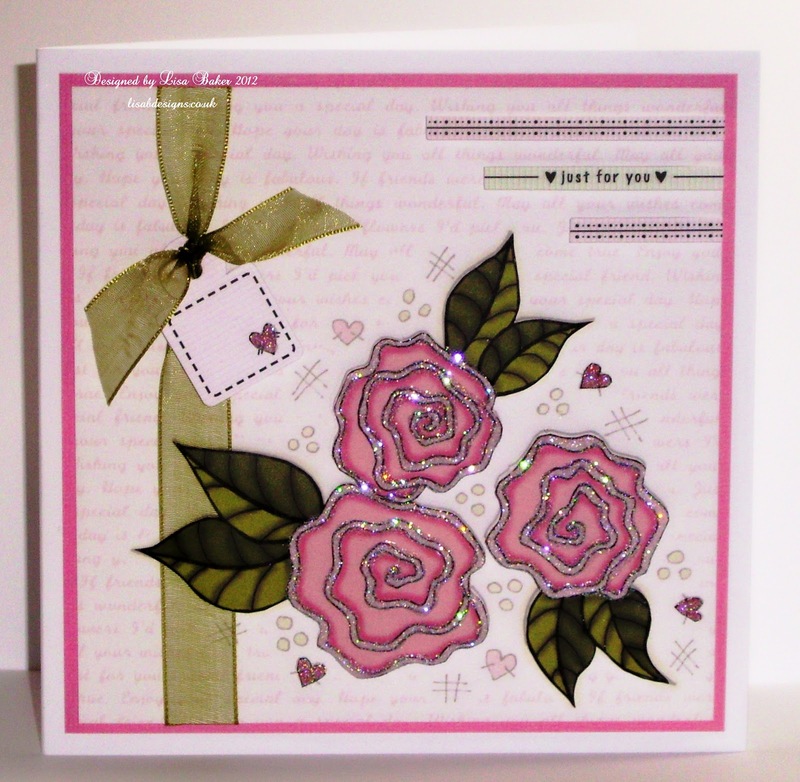 The white card & patterned paper can be coloured however you choose & is in fact, called 'Colour Me'. Use alcohol pens, such as Spectrum Noirs, Copics or Promarkers, for the best results. 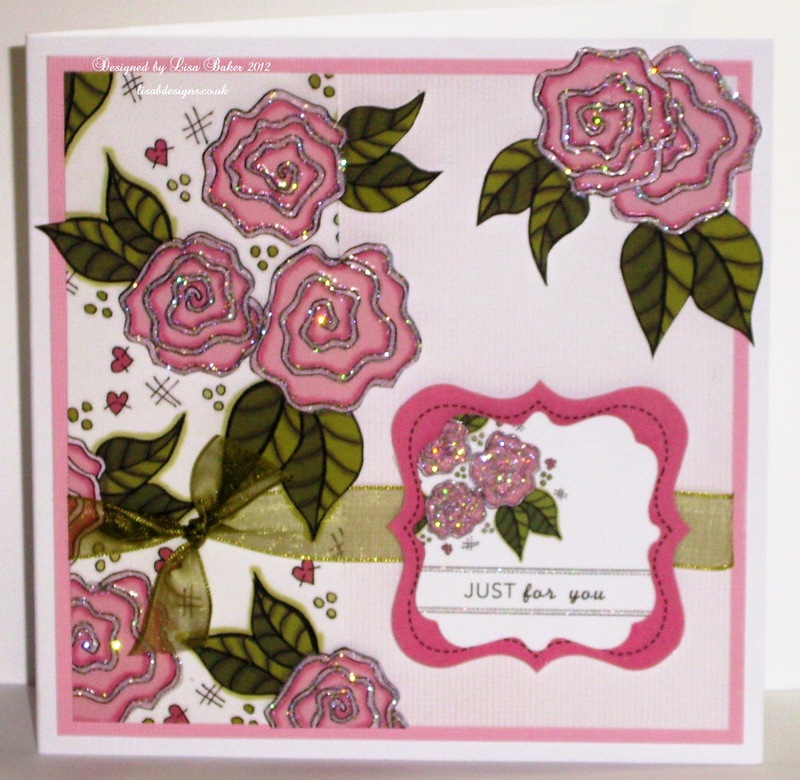 Lisa has coloured the flowers on the card above & added Glossy Accents to give some dimension & a lovely shine. You could also colour the background & leave the flower white, for a different look. 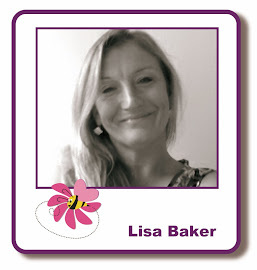 NB: I've just noticed that Lisa hasn't had time to put the Card Candi on the website. Rest assured she will do so & she does have a LOT in stock. So, if you need it badly, drop her an email. Thanks for visiting today. A few housekeeping messages before I go. Our recent Nitwits Week was so successful that Lisa has decided to continue with the 25% off promotion, so if you thought you had missed out, it's not too late. To see our samples start at the final day HERE & scroll backwards. Click on the links in the individual posts or go to the entire collection on the website. 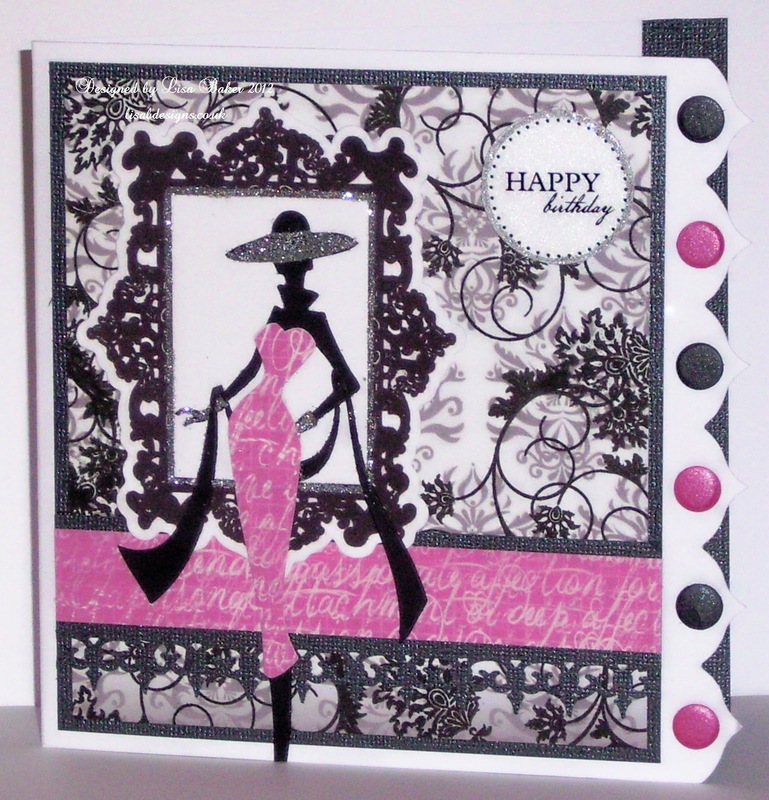 Another promotion on the website is 25% off die cut silhouettes. There are lots to choose from & you can see them all HERE. Until next time, (tomorrow, I hope), take care. Good morning blog visitors, Kirsten here. It's the weekend - yay! It's also rather chilly, which is not so yay. I really am not ready for getting back into socks, boots & coats. Let's not think about it for now. Sorry there were no posts the last two days. Both Lisa & I have been busy with assorted projects. We got some time yesterday to make some future plans for the blog & as Lisa is going to be extremely busy for the next six weeks or so, (she is going to be taking a VERY well-earned holiday too), I shall be responsible for the blog. I am going to try very hard to post every day, but that might not always be possible. One of the ideas we spoke about was doing a weekly/fortnightly photographic tutorial. This will be on a separate page & we're going to call it the Thursday Tutorial. We've got some ideas, but we'd also like to hear from you. What would you like to see? Is there a technique you struggle with? Or do you get confused about which inks to use? Leave us a comment with your suggestions & we'll add them to the list. On to today's cards. 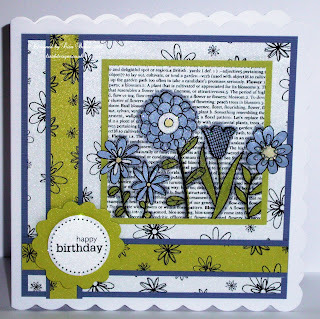 I was looking through my old Craft Stamper magazines for inspiration & came upon one in the July 2009 issue from Helen Chilton, called Down in the Meadow, so I thought I'd have a go. It was all about layers of overstamping & I used two stamp sets & black Archival ink on white card. 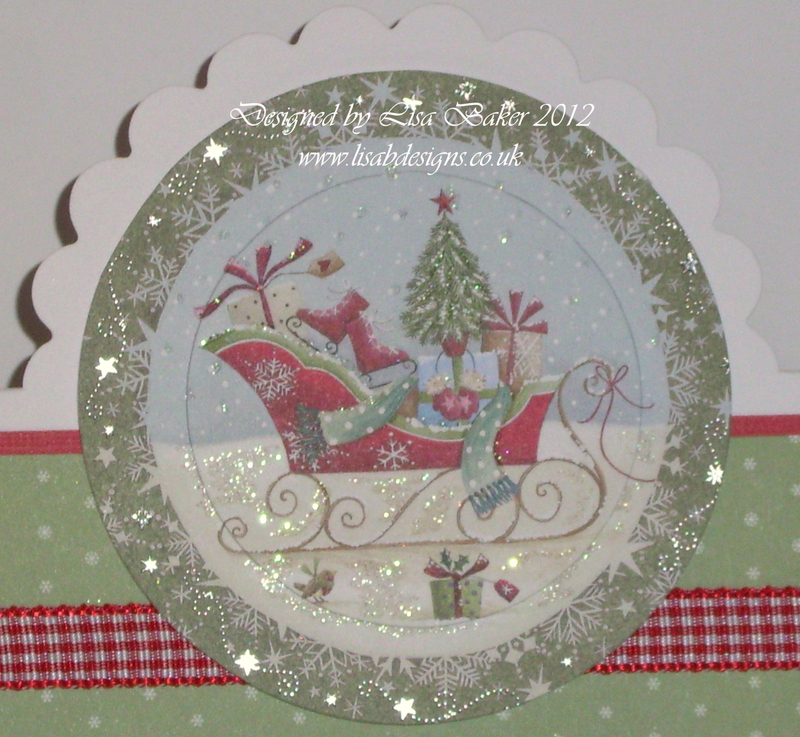 To finish, I stamped the swirl with Versamark embossing ink, covered with white embossing powder & heat set. You need a combination of open & solid images to make this technique work. 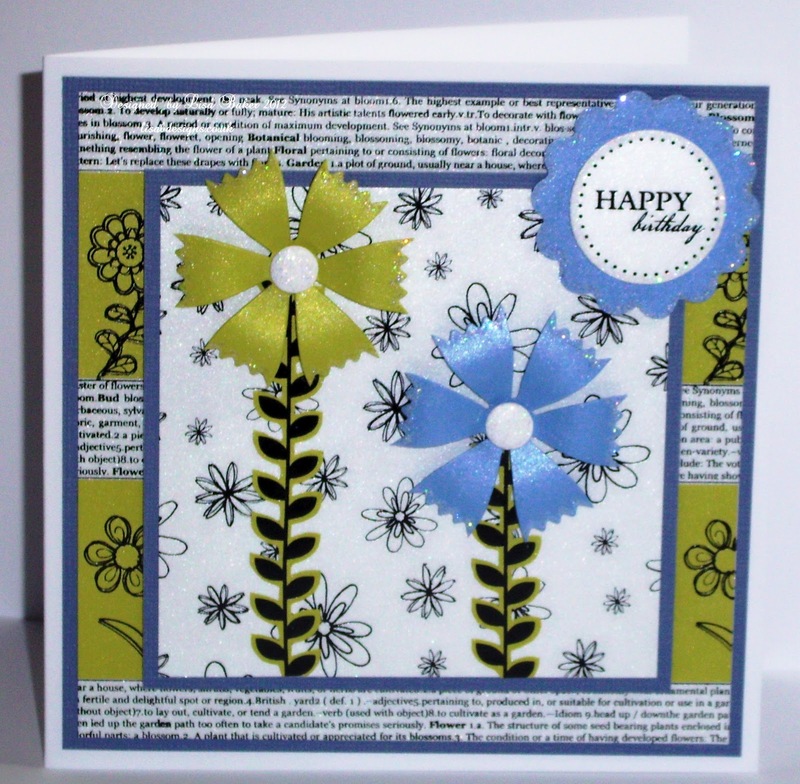 Apart from the swirl, these stamps are open, so I coloured in some of the leaves & flowers with a black, waterproof pen. I worked away on this card & just before I'd finished it, realised I hadn't taken a single photograph, so I made another one with coloured inks instead. I coloured with Spectrum Noir pens as I went this time & stamped with the various inks in different places, building the layers & filling in the gaps. The border around the edge comes from the bottom of the focal image stamp. If you stamp it off the edge of the card you get just the grasses on the image. When you see this stamp on website, you'll notice the flowers are closer together. I cut my stamp in between the two flowers to achieve the curve. Cutting into our stamps may be shocking to some, but I like to get as many uses from mine as possible & this one stamp can now be used three ways. 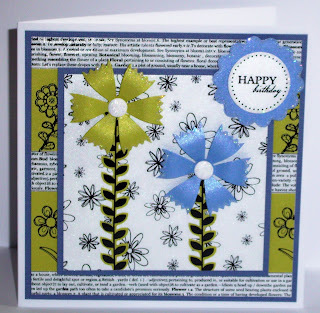 I've spent the last two days looking at this card, knowing something wasn't quite right & I've only just realised what it is - I forgot to add some green to the lower third, which would have anchored the flowers. At least it's something I can easily remedy. That's it for today, thanks for looking. I hope to be back tomorrow. Until then, take care. Good morning, a very brief blog post this morning, I'm afraid. 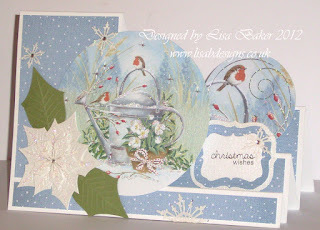 I just want to show you Lisa's remaining Kanban Christmas Collection card samples. You can find everything that's available HERE. More stock is due in shortly, so if you see something you like & it's sold out, add your email address & Lisa will contact you immediately the reorders arrive. Sorry this is so short, I have a very busy day ahead. Hopefully, Lisa or I will be back tomorrow. Until then, take care. Good morning blog visitors, Kirsten here. Hope I find you well, this sunny September morning. Today's post relates to the monthly challenge. Now, I don't know about you, but sometimes it takes me an age to come up with an idea. When Lisa & I decided on the theme for this month - Back to School - I thought it was a great idea. And then I sat down to make something. That was over three weeks ago. Nothing came to mind. I worked on other stuff, including my own projects, hoping that inspiration would strike, still nothing. Until last weekend, when I had a conversation with someone about the Mars Curiosity Rover, (I'm one of those people who goes out at night to wave at the International Space Station as it flies overhead) & I started thinking about a science teacher I used to know, who would have been a perfect candidate for the title of 'Nutty Professor' & I began to see a card in my mind. Unfortunately, I forgot one of the recipe ingredients - a stamped image. But as I'm not allowed to enter the challenge & my project is purely for inspirational purposes, (ahem), I hope you'll forgive me. That's what happens when the Muse abandons you for someone else. 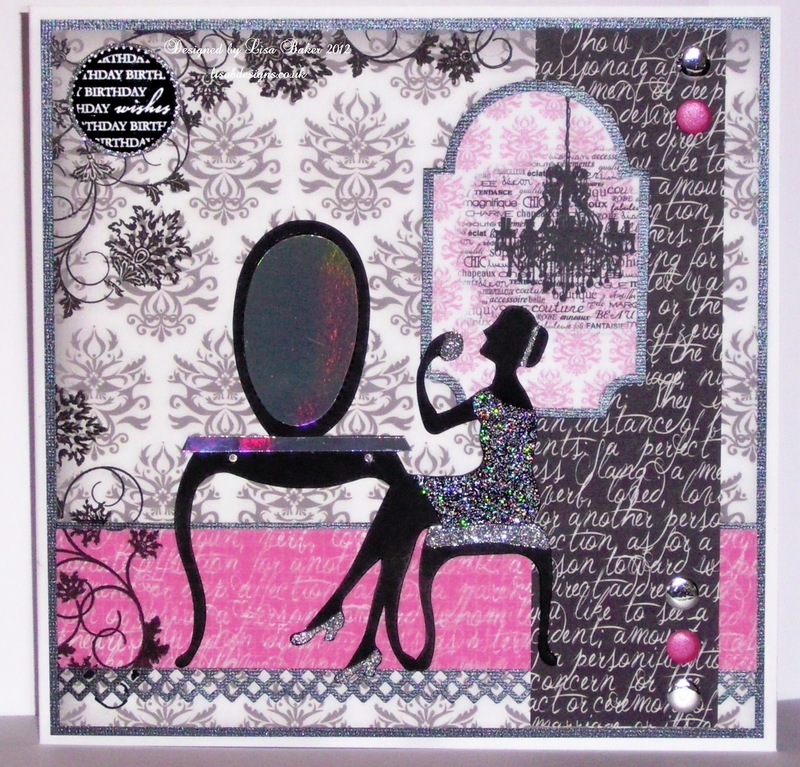 I LOVE all things Steampunk & this Kanban collection is full of great toppers, diecuts & patterned card. 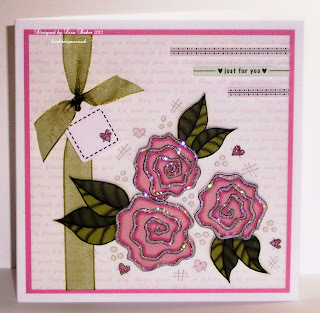 Adding a couple of gears or washers is a great way to add embellishments & they can be coloured with Spectrum Noir alcohol pens to give a different look. I cut the quote from Graphic 45's 'Quote, unquote' 12x12 kraft card, distressed it a little by crumpling it & smudging Vintage Photo & Walnut Stain distress inks over it. 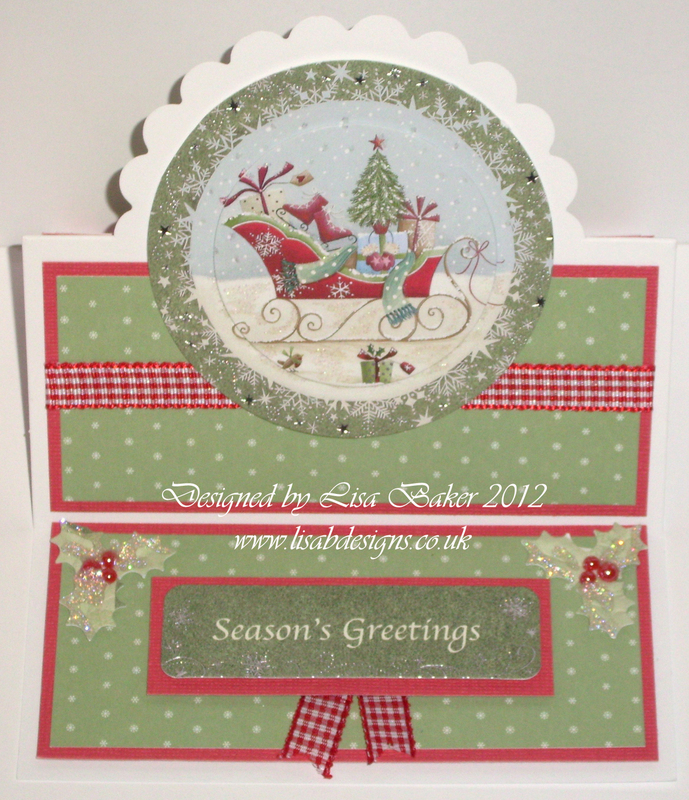 The metal brads & baker's twine are another way of adding embellishments. This patterned paper is Kanban's A4 Timeless card, I added the brad & watch hands to it. When I put everything together the clock looked very flat, so I attached the adhesive pearls from Hobby House - there is a great selection of colours in this range. The paper behind the topper is from a brown paper bag. I tore it, blended distress inks over it, crumpled it until it was very soft & pliable, then added more distress inks. 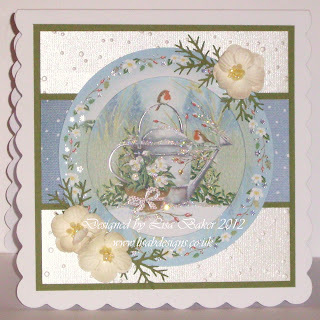 The dark green, speckled paper is from a collection of 12x12 textured papers that Lisa brought to a few of the classes. They are different colours; pastels, brights & dark & they all have great textures, some as in the picture, others are like snakeskin. I don't now what kind of paper they're made from, it's very thin, but not at all flimsy. They're not available on the website yet, but if you're interested, send Lisa an email via the contact page. That's about enough of my rambling. To see the card in its entirety, please visit the challenge page. We seem to have stumped a lot of you this month, because as yet, no one has entered. Please have a go, there's still plenty of time & you could win a rather nice prize. All the details are on the challenge page. Thanks for looking, take care. Welcome to our Special Nitwits week!